It is popular for its rewards program, offering its loyal members some perks including free or discounted membership fees, salon and spa services. It has also established a savings club where members can avail exclusive offers from different local businesses where many of whom are based in Illinois. XSport Fitness was founded in the year 1997. It is owned by Capital Fitness, Chicago and its headquarters is currently located in Big Rock, Illinois. In 2015, it ranked second in the customer satisfaction survey which was conducted by J.D. Power, which was a global market research company. It particularly scored high in terms of the good condition of its equipment and the variety of routines which it offers in its classes. Moreover, XSport Fitness ranked 9th in the Club Industry 2016 top 100 health clubs where it had generated a revenue of $193 million. Also, XSport Fitness maintained an A+ rating from the Better Business Bureau for the last 5 years. The various XSport Fitness gyms operate 24 hours a day throughout the year. Aside from having access to the group workout sessions and personal trainer assistance, you can also avail services that other fitness centers don’t offer. For instance, you can request for customized workout routines that fit your lifestyle. Useful references are also provided for you online such as guides for healthy meal preparations and everything you need to know about nutrition. You can also watch videos for a wide range of exercises which you may want to try even when you’re at home. There are also professional trainers in XSports who can help you accomplish your fitness and wellness goals. After a series of assessments, they design a training program which is especially suited for your personal needs. You can learn a variety of exercise techniques that particularly suit your individual health and wellness conditions. They have professional trainers who specialize in weight loss, strength training, athletic conditioning, muscle building among many. Some of them have also earned have also earned certifications from International Sports Sciences Association, American Sports Fitness Association, and many more. This facility offers a variety of equipment which is sufficient for your workout needs. However, when the gym gets crowded, some of the equipment such as the weights is not returned to their proper places. This is then a bit inconvenient for the next users. They also have different facilties. Aside from the gym itself, they also have salon and spa, café, retail stores for sportswear, a spacious swimming pool, basketball and children’s play area. They also have locker rooms and towel services for customers. Yet, there are instances where the same people use the basketball area every day which gives less chance for other customers to utilize the facility. Members can use the parking area for 2 hours without additional charges. However, if you exceed on the allotted time even for just a couple of minutes, you will be charged $10 per hour. It also starts to become crowded during peak hours. Several customers have also complained about the three business-day rule for the membership cancellation. Many people were confused since the management said that weekends are considered as part of working days. They end up being charged despite an earlier request made for cancellation. The basic membership fee in Xsports can be availed for as low as $9.95 per month. Though, the access to equipment and facilities is limited. On average, the one-time initiation fee for the single and dual membership is $175. The monthly fee for single membership costs around $50, while dual membership costs $35 per person. The annual fees are $600 and $440 for single and dual membership, respectively. On the other hand, there is no charge for cancellation provided that an earlier request before the next billing is made. For first time guests who are at least 18 years old, or 14-17 years old with an accompanying guardian, they can avail the free 7-day guest pass which is valued at $125. To avail this, registration via e-mail address is required. The pass includes free membership and personal or group training sessions for two persons. It is a gym that does not only offer facilities and amenities for your fitness needs. 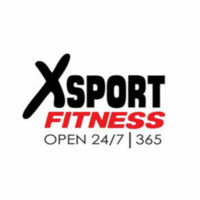 XSport Fitness also has a sportswear retail store, café, salon and spa. Moreover, it also offers access to the pool area, and the CCTV-monitored children’s play area. The members can choose workout sessions with varying intensities and specialized training programs. For instance, if you consider having a special training in boxing, suspension training, or MMA, you can subscribe as a StudioX member. Moreover, it also facilitates a variety of group sessions which include Zumba, Yoga, Cardio training, body toning, kickboxing and many more. Aside from these, they also have different features such as the Corporate Wellness Program for employees, ActivTrax for customized workout sessions and lifestyle choices. Their XSport visual planner tool helps you foresee how you would like in the future once your reach your target fitness goals.